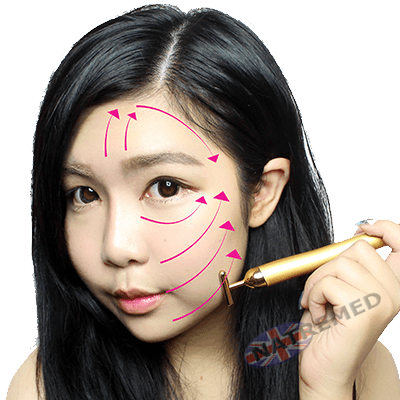 The Beauty Bar 24K Golden Pulse Facial Massager is designed to help promote both facial and body blood circulation, while also relieving stressed facial muscle tension. It barely takes any time to use, is cost effective and results in a glowing, firm skin that will be the envy of any 20 year old you might know. the Beauty Bar 24K Golden Pulse for Skincare - vibrates 6,000 times a minute (micro vibration), giving the facial muscle the correct amount of stimulation in order to achieve a firming effect to improve the skin. It can also reduce wrinkles around eyes, lips, forehead and neck, instantly reshape the face contour to reveal your youthful look and energy! In addition, the 24K gold can beautify the skin, all you need is 2 - 3 minutes per day to easily obtain the firm and radiant skin you always dream of! The natural current which exists inside the body can be affected by pressure and aging, which is the main cause for spots and loosed skin. Since the wavelength of gold ions and living organisms' natural current is the same, a slide of the gold ions on the skin can regulate and balance the bioelectricity, thus promotes metabolism and activates skin cells, giving radiance and elasticity to the skin. Using the technique of micro-vibration, the facial massager works on improving the blood flow to get the circulation of the facial skin going. Once this happens, the result is an immediate tightening of the skin along with a glow that comes with the stimulation. This anti-aging formula can also be used to firm up the skin around smile lines of eyes or lips and works wonders for preventing wrinkles. Its simple use means all you need is a few minutes to yourself and it will work wonders for your skin. Use it 3 to 5 minutes a day for younger, healthier looking skin! It consists of an inbuilt battery and is completely water proof. 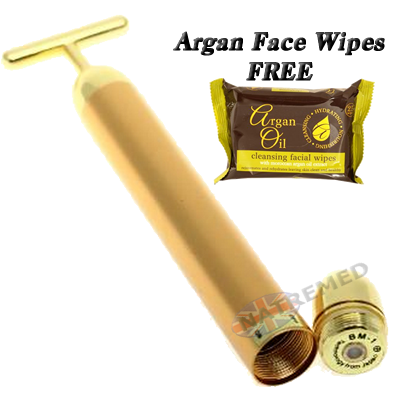 The users have experienced a firm, radiant skin immediately after use and have even noted how relaxing it feels. This sleek, slender product can in fact be carried anywhere you go – a news that will be music to the ears of ladies who travel regularly for work purposes. Compact and portable, the Beauty Bar 24K Golden Pulse Facial Massager fits in your purse, pocket, or bag anytime, anywhere. 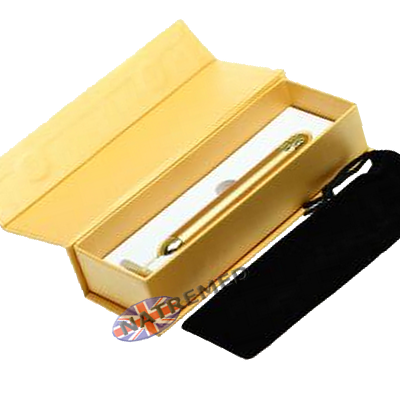 Supplied in Gift Box, with Cloth bag cover. 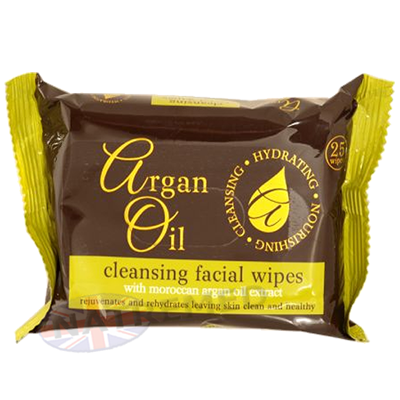 For a limited time, you will receive a pack of Argan Oil Face wipes FREE. When you order a Beauty Bar Massager.